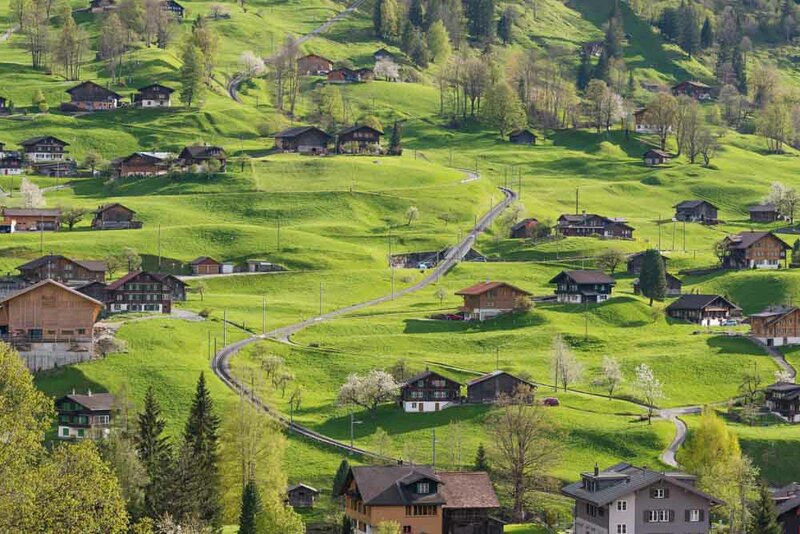 The picture-postcard town of Grindelwald, Switzerland. The stunning buildings adjoining the Baroque abbey at Einsiedeln, Switzerland. The chalet houses of Grindelwald with the spectacular Eiger mountain looming behind them. 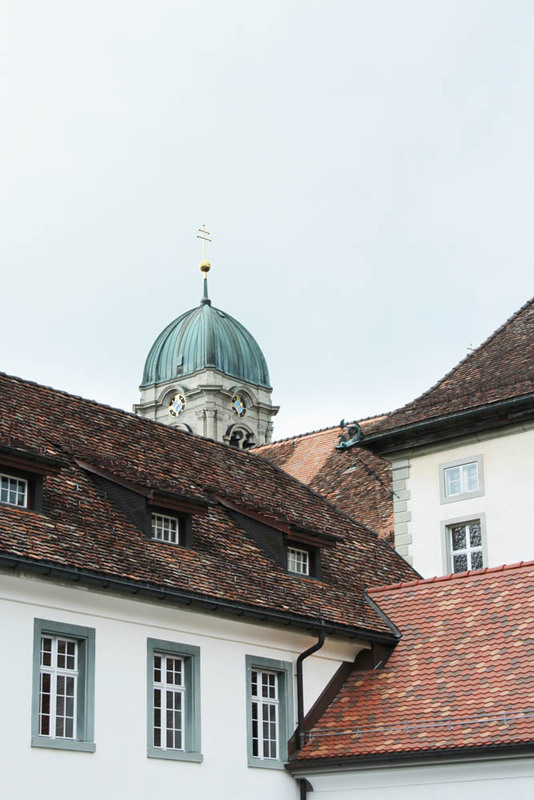 In a country where taking the train has been elevated to glorious heights (no pun intended), Leigh-Ann Pow takes the road less travelled by driving in Switzerland. Switzerland’s train system is legendary; indeed it is how most people get around when discovering the country. So the fact that I will be seeing most of it from behind the wheel of a car almost feels like a subversion. But my rebelliousness is government sanctioned; the aptly named Grand Tour of Switzerland is a big focus for those charged with luring travellers to these parts, with dedicated maps of the route and fun photo-op signposts along the way. While the Grand Tour allows you to crisscross the country this way and that, taking in lovely cities, picture-postcard towns, verdant countryside dotted with chalets and cows, and imposing mountains, I am driving a relatively direct route from Vevey in the west to Zurich in the east. The first leg of my journey (144 kilometres) from Vevey deposits me in the delightful tourist town of Interlaken just after lunch. The sun is shining and the imposing trio of mountains that dominates the horizon – the Eiger, Mönch and Jungfrau – lend the location a sense of drama. One of the best ways to take it all in is from the top of Harder Kulm, Interlaken’s local mountain some 1322 metres above sea level. It is possible to hike it, but I opt for the 10-minute funicular railway journey instead, and end up standing at a breathtaking lookout platform that juts out from the mountain, awestruck by nature’s vast scale and beauty. There’s time to sit in the late afternoon sunshine at the little restaurant that’s perched here, enjoying a drink and some local cold meats and cheese. 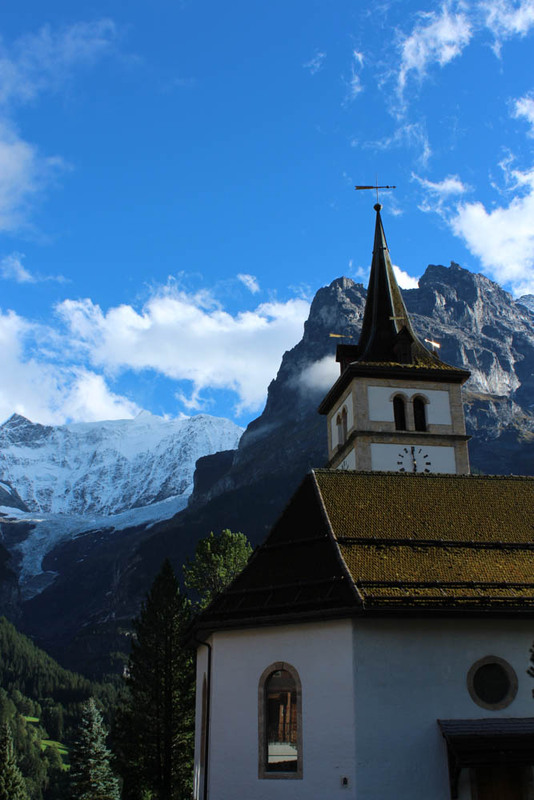 An easy 19 kilometres up the road from Interlaken is Grindelwald, a delightful little town with geranium-festooned chalet houses scattered across its green pastures and sloping mountainside, at the base of the hulking form of the Eiger. I spend the next day atop the Grindelwald First, a much smaller summit by comparison with its neighbours but still suitably imposing. Leaving Grindelwald behind I set off for Bern, some 75 kilometres away, along backroads carved through bucolic cow pastures dotted with traditional farmhouses and punctuated by quiet little villages. Arriving into Bern is completely stress-free, with clear signposting and relatively light traffic (as with many European cities, bikes play a big part in keeping the number of cars on the streets at a pleasant level). I wander the cobbled medieval streets and find a seat in a cafe amongst the locals (and their dogs, who snooze under almost every second table). Back in the lush countryside, this time on my way to Lucerne (109 kilometres away) the road returns to the gentle pattern of cows, farmhouses and towns. My route today passes by the Emmentaler Schaukaeserei, a show dairy where you can see cheese being made in traditional fashion, and through the UNESCO Biosphere Entlebuch, a natural nirvana spread over 400 pristine square-kilometres. I easily find parking in Lucerne and set out to explore. Lucerne is often described as a fairytale city, but fairytales would be lucky to look this lovely. I stay for a few days to really make the most of all there is to see. Back behind the wheel again, the road skirts the edge of Lake Lucerne, giving an idea of its impressive size. I happily cruise along on unhurried roads that I often have all to myself, before arriving into the town of Einsiedeln after about 90 minutes. The drawcard here is the Baroque abbey with its opulently busy ceilings and library packed with thousands of historic tomes. The last 40-kilometre leg of my Grand Tour experience is along Lake Zurich, with intermittent towns slowly morphing into the outskirts of the city. Zurich is another wonderfully manageable city largely devoid of the kind of urban sprawl and gridlock that are the first impressions of many other cities. This marks the end of my Grand Tour, and after days of driving I not only feel like I have seen some of the best bits of the country, but that I’ve had the flexibility and self determination to really experience them. agree completely – spent a couple of weeks driving around the “wilds” of Switzerland. It was delightful, scenic and very calming. Where Road trip guides for Switzerland is rarity , yours is informative but not detailed enough for guidance for a Road trip. I have a stop over of 2 Days in Zurich and would like to make most of it to discover near by landscapes. With no map, rout , you disappointed me. wish you had been little more elaborative.